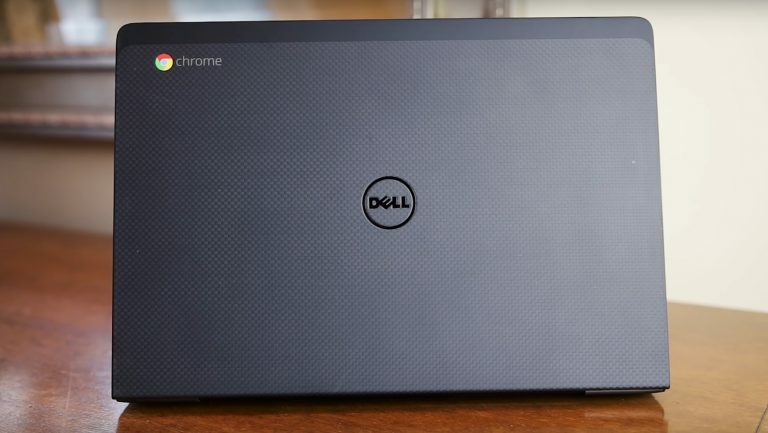 Sober and elegant, the Dell 13 is a mid-range computer geared towards advanced users who are looking for better performance than that offered by basic Chromebooks. Conceived for professionals, this portable computer is much less expensive than its mid-range counterparts. So, does the additional quality and performance of this computer justify its extra cost? Read the rest of this article to find out. The Dell Chromebook 13’s design is one of its strongest suits; it has streamlined edges and a durable case. The underside of its case is equipped with grips to keep it in place, even on an inclined surface. Sober and classy in its matte black finish, this device really gives the impression of being of premium quality. It is lightweight and elegant while at the same time solid and durable which is why it is so well suited to professional purposes. Its 1.5 kg weight and 13-inch display make it easy to transport. It can easily be carried in a bag or suitcase without having to worry about damaging it. In terms of connectivity, however, this computer is somewhat disappointing. It only has one USB 3.0 port and doesn’t have any USB type C ports. Fortunately, it also has an HDMI port as well as a micro-SD card reader and a 3.5 mm audio jack. If you are satisfied with this amount of connectivity, great. But for many people, USB type-C ports have become essential as much for recharging various devices as for transferring data and it is a shame that a professional computer like the Dell 13 has not taken this fact into account. If you absolutely require a USB type-C port, you should perhaps consider the Acer R13 or the Asus C302 instead. This Chromebook’s 13-inch display is superb. With a 1920 x 1080 pixel resolution, its IPS technology displays a bright, crisp image which makes watching videos of all kinds a real pleasure. This display also has an anti-reflection system making the Dell 13 comfortable to use in a brightly lit room or outdoors. In order to take full advantage of this computer’s display, especially when watching videos, you will, however, need to equip yourself with a pair of external speakers or good-quality headphones. Since this computer’s speakers are located on the bottom of the device, they work rather well when the computer is placed on a flat surface, but not so well when it is placed on other types of surfaces. Despite this shortcoming, this computer has reasonably good sound quality which should be satisfactory for most users. Any computer geared towards professionals will require a high-quality keyboard. Since a professional is likely to spend hundreds if not thousands of hours typing long documents on his/her portable computer, it is essential that it should have a comfortable keyboard. Fortunately, the Dell 13’s keyboard satisfies this condition. Its keys are spread out as well as being very responsive and comfortable. In addition to being well-built, the Dell 13’s keyboard is also backlit which is one advantage this computer has over the majority of its competitors. This keyboard’s backlighting makes it is easy to type out a document even in a poorly lit room our outside at night. The Dell 13 also has a very good trackpad. It slides very well and is large enough not to feel constricting. It also clicks fairly well and its displacement distance is ideal. The model equipped with an Intel Core i3 processor is obviously not geared towards the general public. It is only with a powerful processor such as this one that Chrome OS is able to reveal its true potential. This model is able to effortlessly toggle between dozens of tabs and run even the largest Android applications fluidly. Furthermore, this computer is able to play even very demanding video files at 1080p definition with a frame rate of 60 FPS. While this computer’s 16 GB of internal storage will require that you store some of your files in the cloud, adding a micro-SD storage card could enable you to perform more complicated tasks such as video and photo editing. As opposed to entry-level Chromebooks like the Asus C300 or the Toshiba 2, the Dell 13 is therefore geared towards a more advanced usage. If you are looking for a powerful and very fast Chromebook, you will undoubtedly enjoy the Dell 13 despite its higher cost. In terms of connectivity, this computer is equipped with Bluetooth 4.0 as well as dual-band AC WiFi. This connectivity will allow you to connect a pair of Bluetooth headphones for example as well as to enjoy a very fast and long-range WiFi connection. Being a computer destined for professionals, the Dell 13 needed to be equipped with a battery capable of lasting for an entire day of intensive work and enjoyment. Fortunately, with its incredible 13 hours of battery life (during normal use), battery autonomy is not likely to be a concern. Even when used intensively (display luminosity at maximum), the Dell 13’s battery lasts for 9 hours – which should give you more than enough time to get back home in order to recharge your computer’s battery. Fast and powerful and with a beautiful display and excellent keyboard, the Dell 13 has what it takes to satisfy anyone looking for a high-quality Chromebook. Nevertheless, it is somewhat regrettable that this computer is not equipped with any USB type-C ports and that its speakers do not face upwards. If not for these downsides, this computer would be the clear choice within its category. 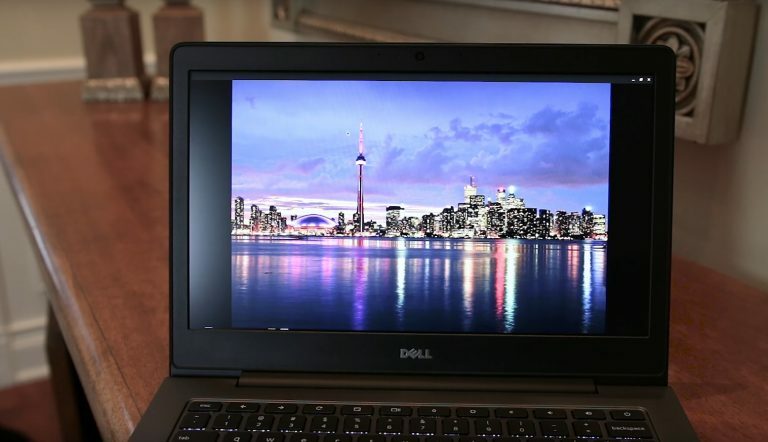 The Dell 13 has good build-quality which justifies, in part, its price – which is higher than that of entry-level models. Moreover, its access to a wide range of Android applications and good performance characteristics make this computer a good choice for demanding users in terms of its potential for productivity. 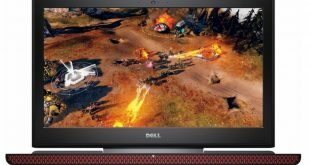 If you are not bothered by this computer’s lack of USB type-C ports or the fact that its speakers point downwards, the Dell 13 is a good option that is not likely to disappoint in terms of build-quality. Nevertheless, it could be a good idea to take a look at its competition: models such as the R13 and the Asus C302 since they have a reversible touchscreen as well as USB type-C ports. If you are looking for a portable computer without a touchscreen and with excellent build-quality, a beautiful display, and advanced performance characteristics, the Dell 13 is a good choice even though it is rather expensive.